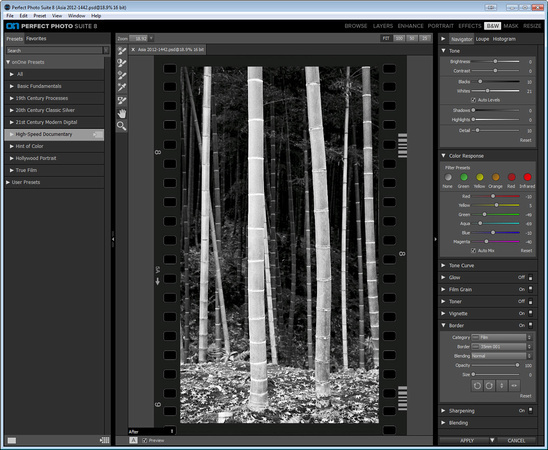 Perfect Enhance is basically like your develop module in Lightroom. It’s the place where you get started with your basic editing as well as where you revisit for your final touches. I love the graphical layout and sharpening panel. This module gets a whole lot better thanks to the new Perfect Brush and Gradient Tool. Everything you liked before is there with subtle but powerful user interface enhancements. Dynamic Contrast is going to be a big hit because it’s similar to what Nik’s Tonal Contrast does but with visual presets and editing aids to help control how much effect is applied using the Detail sliders. Perfect Portrait will feel familiar, but the improved blemish eraser now features content aware fill so it is as effective as Photoshop’s default spot healing brush. Perfect B&W doesn’t seem to have changed much feature wise, but it definitely seems more stable. The brushes are helpful now as well. No big changes for Perfect Resize, but its integration is seamless. 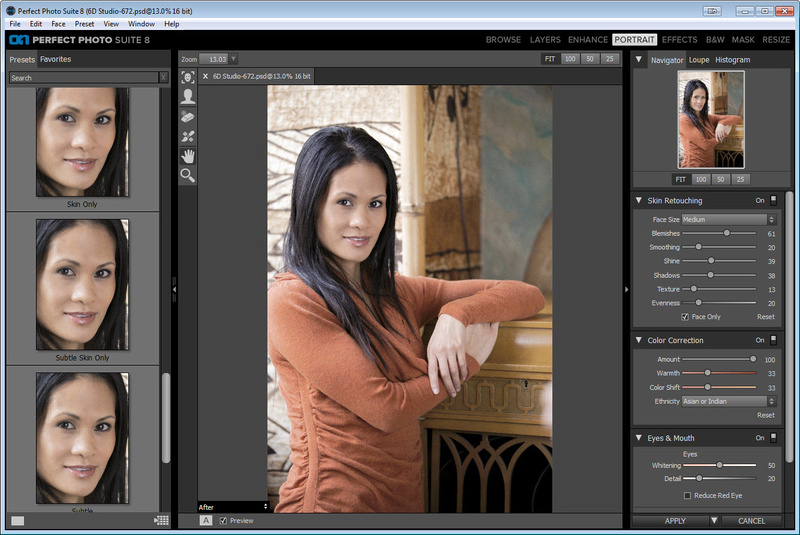 Eight integrated modules – Effects, Enhance, B&W, Portrait, Mask, Layers, Resize, and Browse. Each module is designed to target a specific image-processing task. 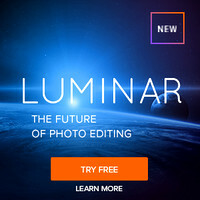 Together, they help photographers enhance, retouch, and stylize images in a layered workflow, replace backgrounds, create high-quality enlargements, and prepare images for use in various capacities. New Module! Perfect Enhance provides essential tools for basic enhancements, such as brightness and contrast adjustments; colorcast, dust spot, and power line removal; and the addition of vignettes. 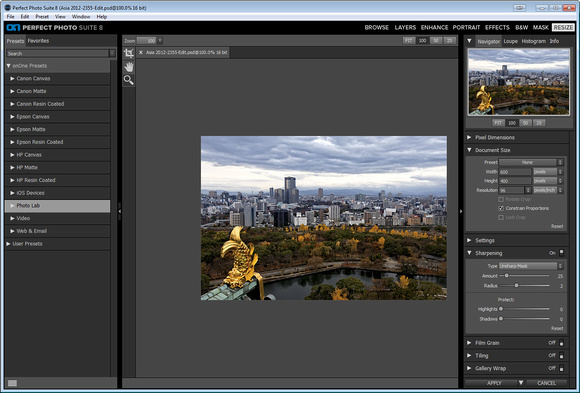 It is an ideal module to start with when using Perfect Photo Suite 8 as a standalone application or when quick corrections are needed. New Module! Browse provides convenient and direct access to image files wherever they are stored—whether they are on a computer, an external drive, a connected network, or on a cloud-based storage service like Dropbox, Google Drive, or Apple’s Photo Stream. Reimagined! Perfect Effects – As a cornerstone of Perfect Photo Suite 8, the Effects module has been redesigned by adding adjustable filters and customizable presets, making it the most powerful and versatile image stylization tool available on the market today. Dynamic Contrast – Adds stunning clarity to images and makes them pop by exaggerating the levels of contrast, without sacrificing highlight and shadow detail, creating halos, or affecting saturation. Lens Blur – Includes the best parts of FocalPoint technology to create bokeh, tilt-shift, and selective focus effects after the shot. HDR – Gives images the edgy look of high dynamic range. Settings are adjustable and create effects that range from subtle to surreal. Vintage – Turns photos into a nostalgic memory with retro-style filters. Hundreds of Customizable Presets are available throughout Perfect Photo Suite 8 that make it easy for any photographer to instantly create an image they love. Presets can also be used as starting points for creativity and efficiency. 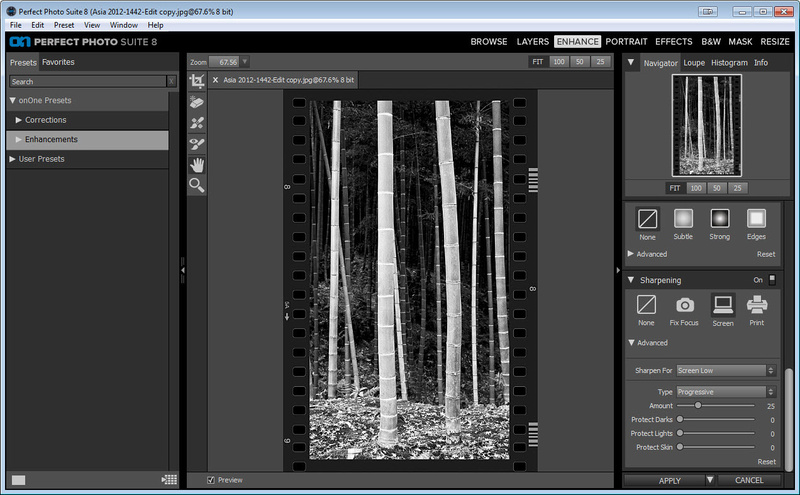 Presets are included in the Enhance, Effects, B&W, Portrait, and Resize modules. 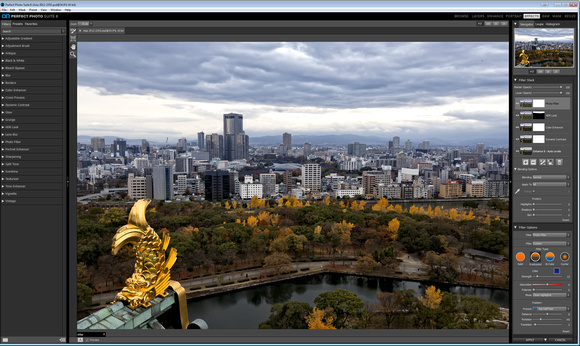 Improved Masking Bug in the Effects and Layers modules make mask creation easier and more intuitive. 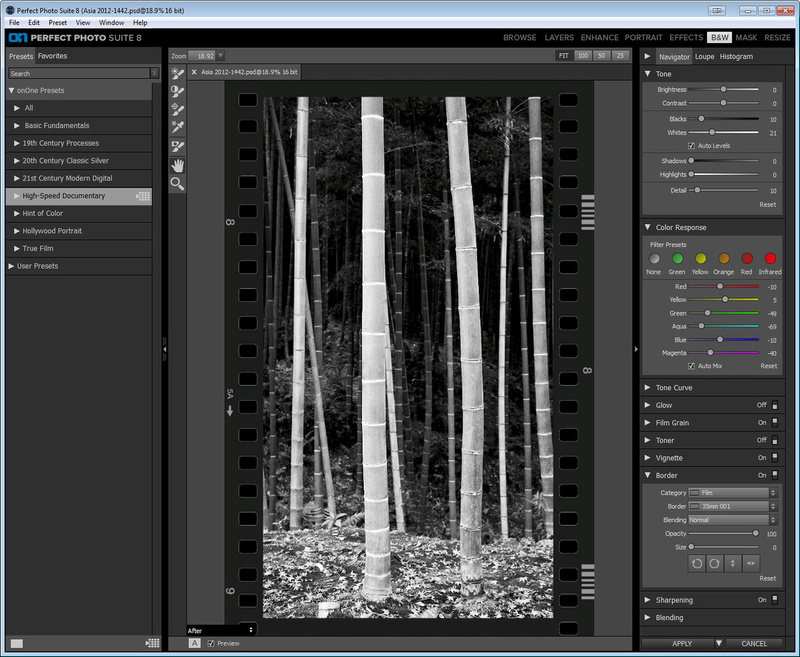 Perfect Batch engine simultaneously applies presets from multiple modules and a watermark to a selected group of images. 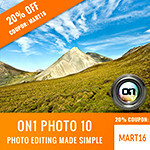 The new Perfect Photo Suite 8 is now available at www.ononesoftware.com/store. Perfect Photo Suite 8 is available in three editions: Premium, Standard, and for Adobe Lightroom & Apple Aperture. I wasn’t a big fan of Focal Point and I hated its “bug”, so I’m not too sad to see it go. With the Perfect Brush making masks easy, I find myself using the brush quite often – much like I use U-Point controls in the Nik Collection. I’m also excited about how fast and reliable this version seems to be, and how the brushes feel as effective and powerful even more so than the one in Lightroom. With the browse and enhance modules, it’s now very possible to do all your work just in the onOne Suite. The lack of a good noise reduction solution is probably its biggest handicap, but if you aren’t using noise reduction software, then you’ll probably not even notice this issue. I’ll have more to say in my upcoming full review of the new suite, but my early testing makes it a no brainer upgrade for me. The perfect brush, dynamic contrast, improved performance and better integration make it the most flexible and powerful version yet. Click here to order and learn more. 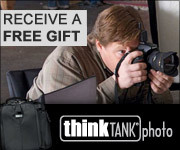 I find it hard to believe your glowing review of Perfect Photo Suite 8 when after reading it I see the following posted on your web site... "If you make a purchase using links found in this article, I may make a commission. It doesn’t cost you a penny more, but it does help to support future articles like this." Rather hard to believe you are making an unbiased review after reading such. Would you rather I do like most of the other sites and magazines out there and not tell you the reality of how I make money on my blog? Would you prefer that I charge a subscription fee for the content? For 5 years this blog was run by me working from 10:00 PM - 4:00 AM+ Sun - Thurs, so yes I do get compensated for my effort. However, I try to be honest about it and guess what if you buy elsewhere someone else will get the commission, but the fact is someone is always getting a commission for your online purchases so welcome to the reality of the Internet. Guess what, magazines make money off advertising too! Except for a few short trial periods, I've not allowed advertising on my blog and have given it away free to select partners for products that I believe in. On a separate note, this wasn't a full review - it was a short article about my thoughts of this product after it was released. I do hope to do a larger review of 8.5 very soon. Not a comment on this. I appreciate your honesty. I have also learned to love Perfect Photo through your tutorials. One question: is there any way to rotate images in PP? 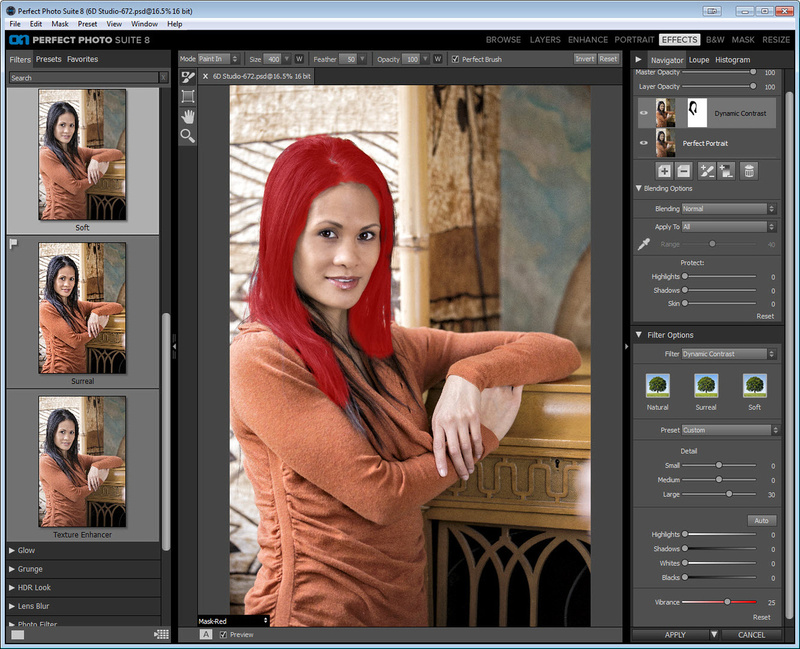 I am finding it very frustrating that I have to go out of PP and into Lightroom or Photoshop to straighten up an image. I wish they had Photoshop's incremental rotate, whereby you can set it to a level. 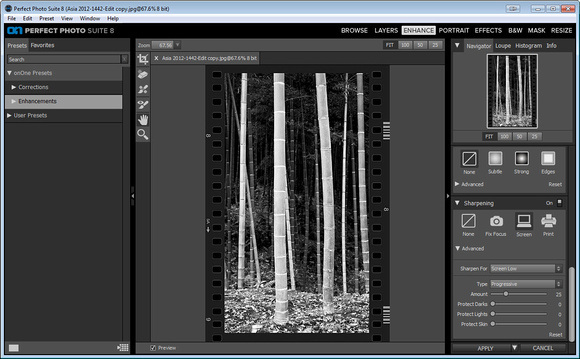 But, mustn't complain, this is a great programme which will certainly give Photoshop/Lightroom a run for their money. It's not a replacement, just a very capable addition to the photo-editing stable.